Sleep up to 4 people in these beautiful, 1 bedroom cabin rentals! 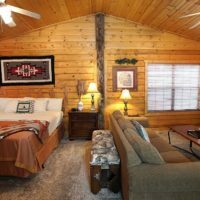 Set in the heart of the Ozark Mountains and forests, these rustic one bedroom cabins are perfect for families, couples, anniversaries, honeymoons, & special occasions! Cozy & Comfortable Rustic Log Cabins! There is no better way to stay in the heart of the Ozarks than in one of Branson’s beautiful cabins. These one-bedroom vacation rentals provide the perfect layout, size, and space for your stay. Whether you’re traveling with friends, family, or your loved one – these smaller cabins can accommodate many different types of travelers with ease. The layouts of these units are built for comfort for up to 4 people and usually feature a master bedroom, one master bathroom, and a sleeper sofa, in addition to large commons areas that often include a living room, dining, room, kitchen, and (usually) a porch in the back. Great for Honeymoons, Anniversaries, & Special Occasions! If you’re looking to rekindle romance or celebrating a special occasion with your loved one, these units provide the perfect setting for your unforgettable trip. Those celebrating their honeymoon, anniversary, or simply looking to get away on a romantic rendezvous will find these cabins offer everything you could want for a memory-making getaway. Many of these cabins offer private hot tubs or jacuzzi/jetted tubs, fireplaces, and have plenty of space for rest and relaxation – ensuring a perfect stay that you won’t soon forget. The Perfect Size for Couples, Friends, & Families! Because these one bedroom units are the smallest size you will find in Branson (aside from studio cabins) – they are a great choice for friends, families, or couples traveling together. Typically, they feature a master bedroom that is tucked away in an adjoining master bathroom, providing space and privacy while the pull-out sleeper sofa in the living room gives you yet another area for sleeping. Upscale, Luxury Lodging at its Finest! 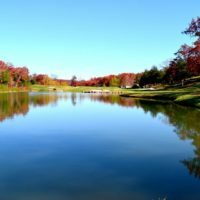 Whatever the case for your travels may be, you will find these to be some of the most appealing and popular types of cabins in the Branson area. Perfect for a romantic getaway or a small family, these one bedroom rentals offer a unique and unforgettable way to stay in the area. Due to the limited number of 1 bedroom cabins in Branson, these units tend fill up quickly! We highly encourage reserving your stay as early as possible to ensure availability and the best rates!